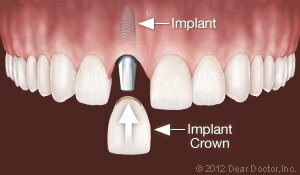 A dental implant is a post, usually made of titanium, that serves as a substitute for a natural tooth’s root. 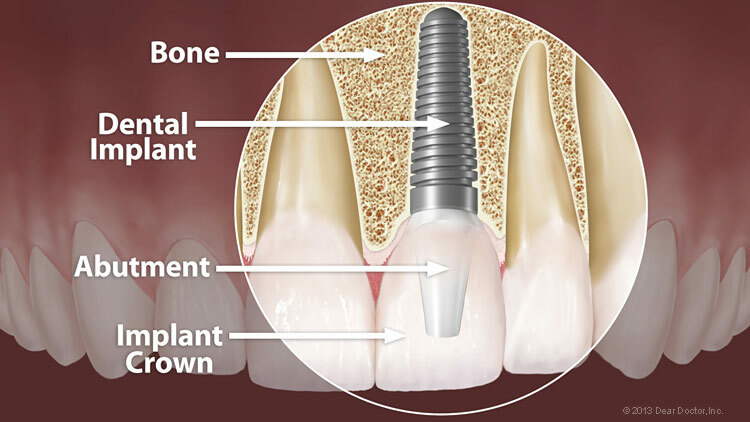 The implant is placed in the jawbone so that it may fuse with the natural bone to become a sturdy foundation for a replacement tooth. 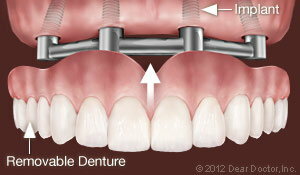 Implants can be used to replace individual teeth or to support a bridge or denture containing multiple teeth. Dental implants can be provided to most patients who are missing teeth due to decay, disease, injury or other medical conditions. You also may be a candidate for a dental implant if you can’t wear dentures or find them uncomfortable, or if you don’t want to sacrifice existing tooth structure to support a dental bridge. Since surgery is required, implant patients must be in good general health with healthy gums and adequate bone structure. 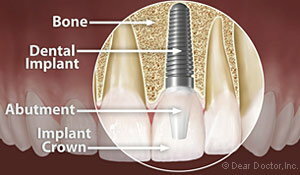 If an implant site lacks the adequate structure, a dentist may be able to perform procedures to improve it. Implants are not for everyone, however. Conditions such as bruxism, diabetes or leukemia may interfere with healing after implant surgery. This also is the case for patients taking bisphosphonates for osteoporosis. Additionally, patients who drink alcohol or use tobacco may not be good candidates for implants. Talk with your general dentist to find out whether dental implants are right for you. 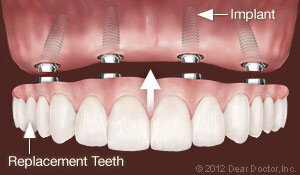 Implants can be used to replace individual teeth or to support a bridge or denture containing multiple teeth. Once the implant placement surgery is completed — usually in an hour or two — the healing process begins, and this can take as long as six months. 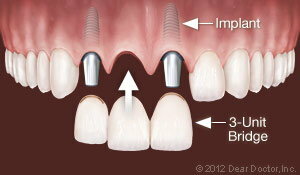 Additionally, the fitting of the permanent replacement tooth is usually accomplished in one to three weeks. Your dentist may provide you with a temporary replacement to help you eat and speak normally until the permanent replacement is ready. If your bone structure is strong enough, however, your dentist may be able to place the implant and replacement tooth in one visit. A major reason some implants fail is poor hygiene. It’s important to brush implants at least twice a day, as well as to floss. Additionally, as many as four dental cleanings per year may be necessary to maintain gum health.